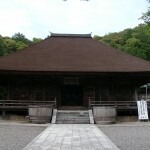 The foundation of this temple in northern Okazaki dates back to the latter half of the 7th century. An ascetic priest who had been living as a hermit in the nearby mountains is said to have constructed the temple on the orders of the Emperor Tenmu (emperor from AD 673 to 686). 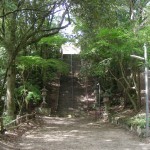 In the first few centuries after its original construction, the Buddha of Healing was worshiped here and the temple was called Kishoki temple. The temple of that era would have been of simple wood and thatch construction, unfortunately nothing remains of the early temple besides archaeological items. Kichioki temple was a center for worship for the local community, for the next several hundred years through the age of reform and the Nara Period. The temple we see today was built by a priest named Kanden. Kanden was an elder cousin of the great Japanese warrior and founder of the Kamakura shogunate Minamoto Yoritomo (1147-1199). 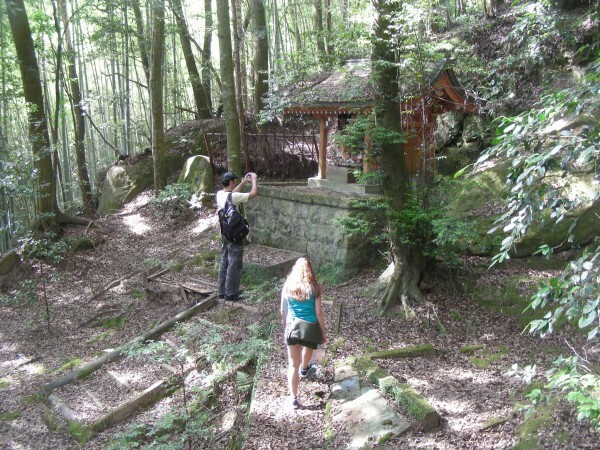 On the first anniversary of Yorimoto’s death, Kanden began constructing a Zen temple here and enshrined Yoritomo’s hair and teeth inside the womb of the statue of the Goddess of Mercy. 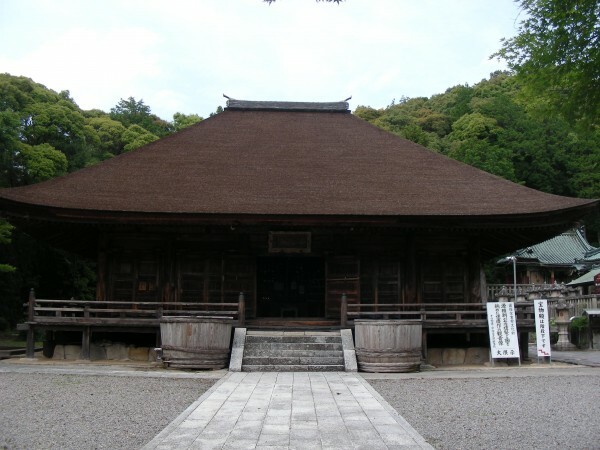 These days, the main hall of the temple is famous for its perfection of the Kamakura Period (1185 – 1333) style of architecture – dating from its reconstruction in that style in the year 1222. The Oni Matsuri (Ogre or fire festival) is held here every February – usually on the Saturday closest to February 7th as this is the the New Year in the old Lunar Calendar. Part of the festival involves blessings for 42, 25, and 12 year old males – of which about 3 males are selected as representatives for participation in a ceremony held in the main hall. The 3 males wear ceremonial masks – the 42 year old wears the mask of a grandfather, the 25 year old the mask of a grandmother, and the young boy wears the mask of a grandson. In addition, about 30 men (usually but not necessarily elderly men) who were born in a year with the same sign of the Chinese zodiac as the year of the festival [Rat (nezumi), Ox (ushi), Tiger (tora), Rabbit (usagi), Dragon (tatsu), Snake (hebi), Horse (uma), Sheep (hitsuji),Monkey (saru), Rooster (tori), Dog (inu)] participate in a ceremony holding burning torches. 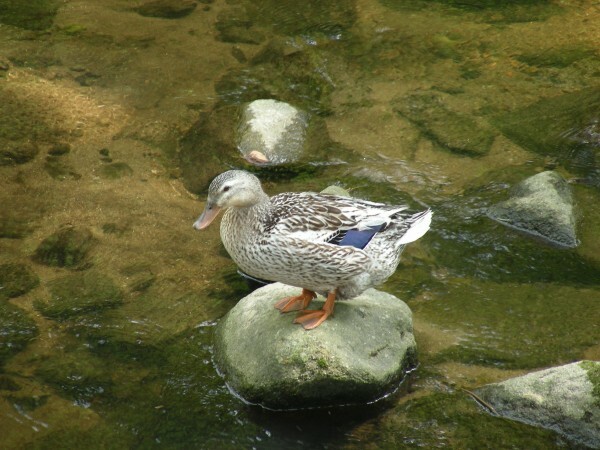 The festival is famous in the Mikawa region as a traditional religious ceremony to greet the beginning of spring. 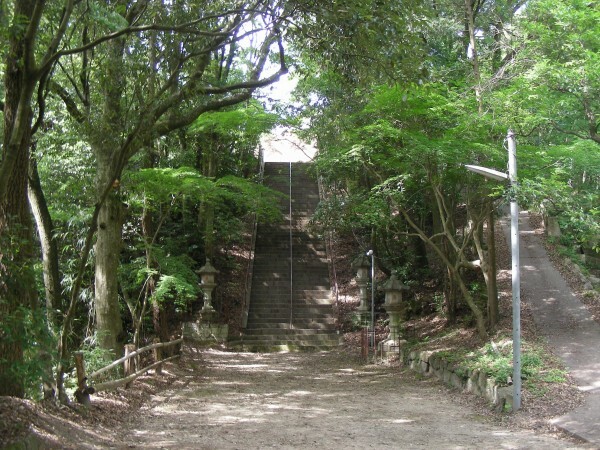 Takisanji has many national important cultural properties including the Kamakura-styled Main Hall, Sanmon Gate, and the sacred statue of the Goddess of Mercy which not only has some of the remains of Yoritomo, but is also said to be built in his life-size. 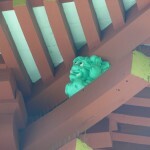 Have a close look at Sanmon Gate. The gate is some distance from the Main Hall these days, which gives us a good idea of the size of the temple during its heyday. 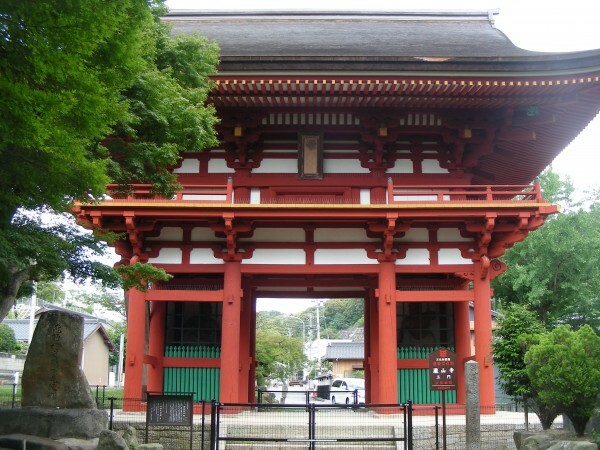 The gate was built in 1267 by Fujiwara Mitsunobu, a master carpenter and builder of high social rank from the mountain province of Hida (now the Takayama area of Gifu prefecture). It was built to perfection both in terms of the depth of its entire structure and in the mightiness of its large shingled roof. 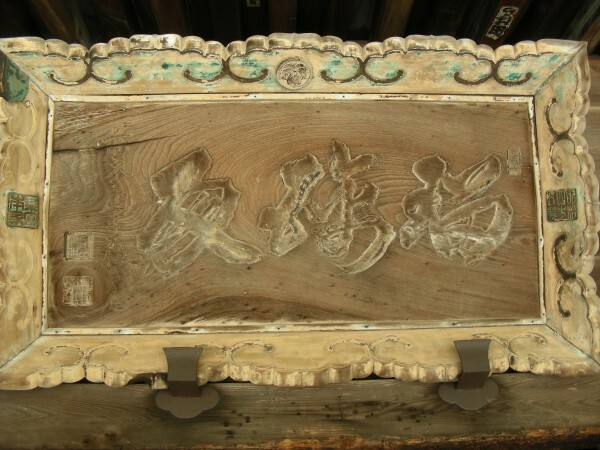 The gate is made from wood and plaster, the bright coloring coming from the vermilion coating. 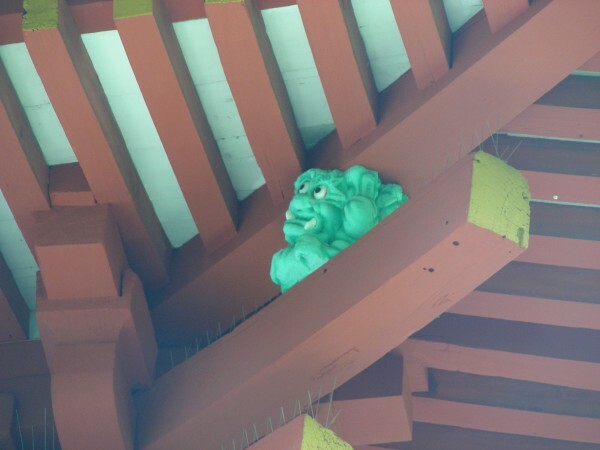 If you look up under the eaves of the roof you can see in each corner a small figurine resembling a gargoyle. Guarding the entrance to the gate are two wooden statues called Niouzou. The one of the right of the gate (pictured) is agyou (a – the beginning of all things – similar to alpha), and the one on the left is ungyou (un – the ending of all things – similar to omega). The character read as gyou, means figure or shape. Each of the statues are 287 centimeters high (approximately 113 inches) are were carved during the first half of the 15th century. Unfortunately the Niouzou are protected by wire to prevent them from being damaged or vandalized, so you won’t usually be able to obtain a close look. At festival time, priests from the temple attach woven straw sandals called waraji to the wall in front of the Niouzou – new shoes for the deities. At the time of construction, it was common to leave part of structure imperfect, partly out of superstition for the destruction that seemed to follow beautiful things, but also because they believed in the saying “Every tide has its ebb”. As a result, even as people were looking at this perfect work, they would whisper that even the Master of Hida had somewhere surely made a mistake. 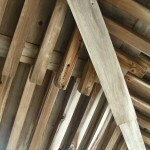 It appears that one or more of the rafters (wooden beams supporting the roof) had been inserted back-to-front. Upon hearing this, Fujiwawa Mitsunobu, ashamed that a master builder such as himself appeared to have made a mistake, jumped off the upper story of the Sanmon Gate to his death. It is said that later a tree grew on the ground where the master died and blossomed every year, but never bare fruit. The mound to the left of the gate is said to contain his some of his remains. 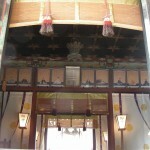 Side by side with the main hall of Takisanji Temple is Takisan Toshogu Shrine. This Shinto shrine was built in 1646 by the powerful 3rd Shogun Tokugawa Iemitsu, and is the top 3 Toshogu Shrines in Japan, the others being Nikko and Kunozan. 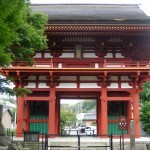 The Main Hall, the Hall of Worship, the Nakamon Gate and the Torii Gate were all designated as national important cultural properties in 1953. Takisan Toshogu Shrine is on the highest site of the east side of Takisanji Temple’s Main Hall, and is brilliantly colored in the Toshogu style. 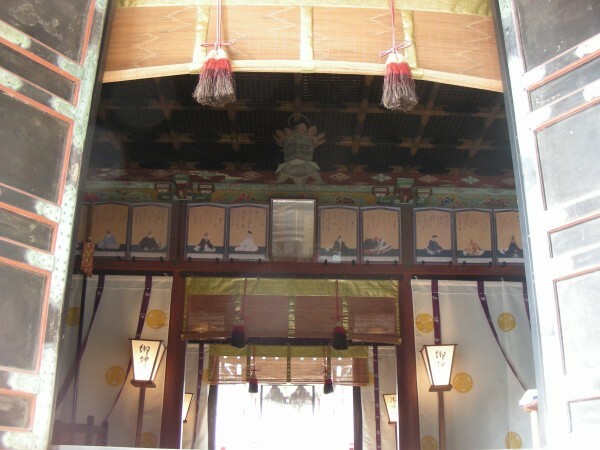 The magnificence of the shrine and the 50 stone lanterns donated by the lords of Okazaki Castle for generations of the Tokugawa family give evidence of the power and influence of the Tokugawa Shogunate. 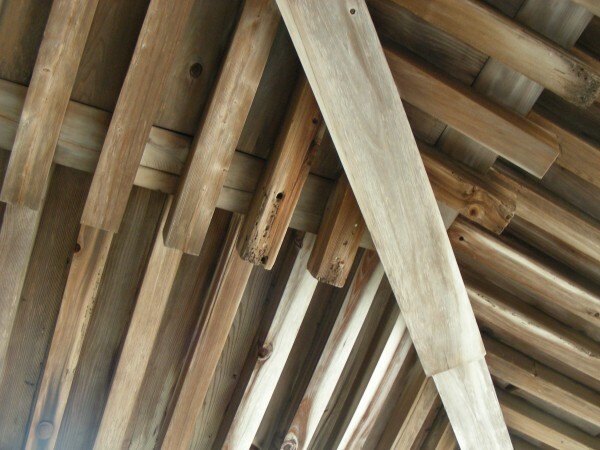 The shrine was reconstructed from 1969 by the Cultural Agency, and restoration (both of the Toshogu shrine and the much older Kamakura era Takasanji temple main hall) continues. 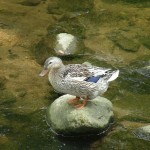 The beauty of its style vividly remains. 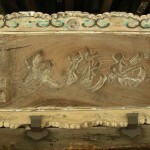 It roughly translates as “water holding the sacred powers of the healing buddha in water manifestation”. 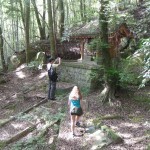 There is a small altar about 300 meters along a walking path through the forest.